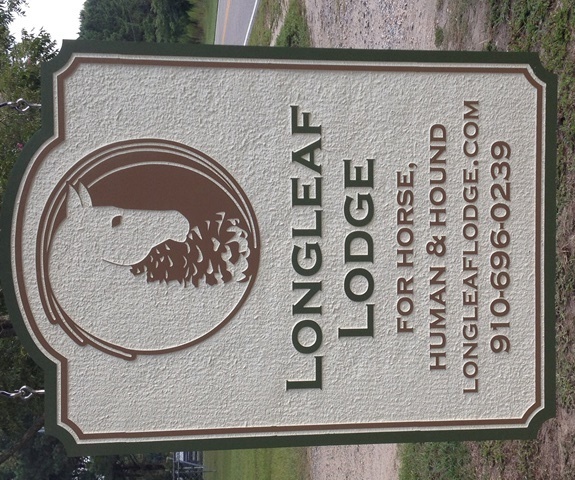 Longleaf Lodge is a horse, human & hound boarding lodge & farm established in August, 2015. It is owned and operated by Beth & Paul Bockoven and Nancy & Spencer Willard. Our favorite things about Longleaf Lodge are the beautiful green pastures, sunrises & sunsets, and time to spend with family & friends. We hope that you will enjoy these things and many more when you stay at Longleaf Lodge. Longleaf Lodge is located west of the Southern Pines/Pinehurst/Aberdeen area in Hoffman, NC and is situated on 19 acres with multiple barns, pastures & paddocks, a round pen & a riding arena. It hosts a 4 bedroom lodge consisting of 2 rooms with a shared hall bathroom and 2 suites with adjoining bathrooms. The lodge also has 2 kitchens, 2 dining rooms, 2 living rooms and outdoor dining areas. Longleaf Lodge is uniquely positioned in the very center of the Sandhills Gamelands. Guests staying at Longleaf Lodge have access to many forms of recreation on 63,000 acres of public lands. The Sandhills Gamelands are an ecologically rich natural area that deserves exploration. Beth Bockoven is a North Carolina native growing up in Scotland County and spending her youth riding in shows & horse trials in Southern Pines. She has a BS & MS in Biology. She loves nature and informal science education. Her past careers include preserve management for The Nature Conservancy, co-director of an environmental education summer camp, and, operations manager & education coordinator for a children's museum. Beth is thrilled to return to the stomping ground of her childhood. She is married to Paul Bockoven whose career has included Vice President of Outdoor Education & Camping at Kanuga Conferences, co-director (with his lovely wife) at an environmental education summer camp, and Director of IT at Kanuga Conferences. Beth & Paul have two daughters, Carson and Cecilia, and two dogs, Charlie & Buddy. The family is rounded out by two cats, Io & Ganymede, and a spotted horse, Rocket. Nancy Willard is a retired Methodist minister. She loves plants, horses and life on the farm. Spencer Willard is a retired public school teacher, life-long coach, and official farm "jack-of-all-trades.' Nancy & Spencer brought the dream of a horse farm to reality and love living on the property in their "tiny" house. Longleaf Lodge sits on property that was historically a large working farm owned by the Myers family. John Harmon bought the property and established a hunting lodge. Sandra Chadbourne created Chadbourne Farm & Stables from 2008-2015 establishing a boarding lodge for horses, humans & hounds. Longleaf Lodge property has always been the home of farming and great hospitality.